Check that you have Microsoft.NET 2.0 or greater package installed. 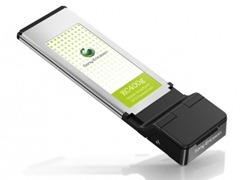 Make sure that the ExpressCard is removed from your laptop. Run the "setup.exe" file. The Wizard for the Wireless Manager displays. Follow the on-screen instructions. When installation is complete, click Finish. Fully insert the ExpressCard (with SIM card) into your laptop PC.